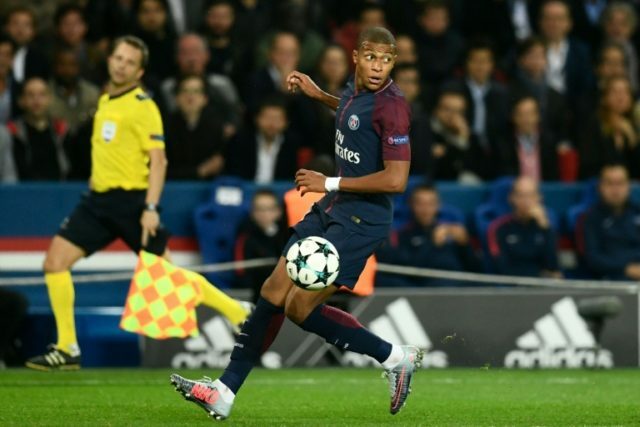 Paris (AFP) – Kylian Mbappe was singled out for praise despite being the only member of Paris Saint-Germain’s superstar attack who didn’t score in Wednesday’s big Champions League win over German giants Bayern Munich. Dani Alves, Edinson Cavani and Neymar netted as PSG eased to a 3-0 victory at Parc des Princes to make it two wins from two games in Group B and take a huge step towards progressing to the last 16. But Mbappe, with his frightening pace and skill, set up Cavani’s magnificent strike that made it 2-0 and left David Alaba for dead as he created Neymar’s goal in the second half. “Kylian is progressing well. He has great talent and great desire to help the team grow,” said coach Unai Emery of the 18-year-old, who got the biggest roar of the night from the 45,000 home fans in the French capital when he made way for Angel di Maria late on. The French teenager was making just his second appearance at Parc des Princes since arriving from Monaco on an initial loan deal that will become permanent next year, for a fee rising to 180 million euros ($211 million) with bonuses. Only Neymar, at 222 million euros, will have cost more in the history of football and along with Cavani, PSG look to have a potentially Champions League-winning strike force. But they will need to remain in this form and avoid the kind of tensions that marred the recent win over Lyon, when Cavani and Neymar argued over who should take a penalty. The ‘MCN’ attack have now scored 18 goals between them this season and they have also made PSG more adaptable, able to transform into a side that soaks up pressure before destroying opponents on the break. “Normally we control games with possession against deep-lying defences. Today they defended higher and had the ball but we controlled the game without it,” said Emery, whose side have scored eight goals and conceded none in two European outings. “In the Champions League we must never think we are the best because we are not. There are lots of strong sides, and Bayern came here to impose themselves,” said midfielder Marco Verratti. While PSG move forwards, on this evidence Bayern are heading in the opposite direction after suffering worst group-stage defeat in the Champions League in 16 years. Javi Martinez came close to equalising for the Bundesliga champions in the first half but they were not up to their usual standards, in keeping with a below-par start to the season. “I thought before the game that they were very strong, very dangerous. We prepared to have good control of the match and we did, but we didn’t have the necessary balance and that was the key,” admitted under-pressure coach Carlo Ancelotti. Ancelotti also dismissed questions from German media over his decision to leave Franck Ribery, Arjen Robben and Mats Hummels on the bench at kick-off. “I have no regrets,” said the Italian, whose team host Celtic next.